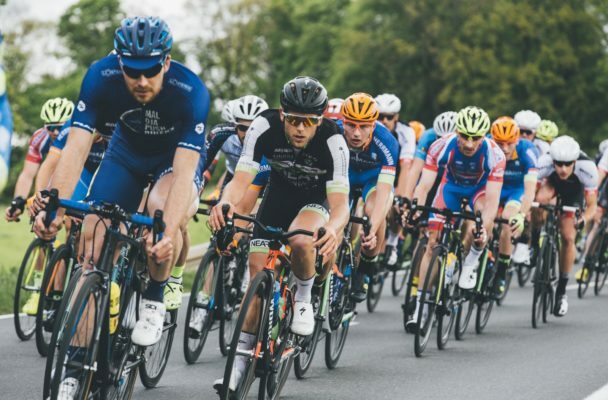 Cycling injuries form a small part of the cycling experience but there are some issues that are found to be more common. The following are a few of the most common cycling injuries and ways to avoid them. The hours spent in the same position curled over the handlebars mean that one of the most common injuries that cyclists suffer from is lower back pain as stress is being placed on the whole spine. To prevent this injury occurring in the first place make sure you’ve set up your bike correctly. Try to avoid overreaching which usually means your frame is too big, or a hunched posture and your frame being too small. Adding in some core exercises into your fitness regime will help protect your back and make you a more powerful cyclist. Knee pain is another common cycling injury and is usually caused by a poorly fitting bike. A tight IT band, which is the fibrous tissue that runs down the outer thigh, caused by less flexibility and a repeated action can change the muscle balance around the knee and create tension. To prevent any damage to your knees, check the height of your saddle and make sure it suits you as this can have a big impact on the state of your knees. Try adding in some hip and knee stretches to reduce tension and increase mobility and finally, try not to over-train and make sure you utilise rest days. Neck pain in cyclists normally originates from riding in the same position for a long time and the pressure on your neck from hyperextending. To avoid this, make sure your bike fits you well and you’re not straining to reach the handlebars. You should also check that your handlebars are not too low as this can put added pressure on your neck. Saddle sores is a painful skin irritation that develops after spending many hours on a bike. It’s caused by the friction between your skin, clothes and the saddle and can lead to unpleasant rashes. Make sure you’ve got a well fitting saddle that suits you and invest in some decent cycling shorts that have a bit of padding. You can also buy some chamois cream to help reduce friction. Numb feet is another common find among cyclists. This can be caused by ill-fitting shoes or cleats, cleats being placed too far forward or excessive hill cycling, both of which put added pressure on your feet. To avoid this make sure you invest in properly fitting cleats and you may need a pair for summer and a pair for winter depending on how your feet swell. Make sure the cleats are positioned correctly to alleviate pressure and try to mix up your cycling training so you don’t go overboard with hills.